Auction Closed. Sold via Buy Now $800. Next Auction Monday August 21. 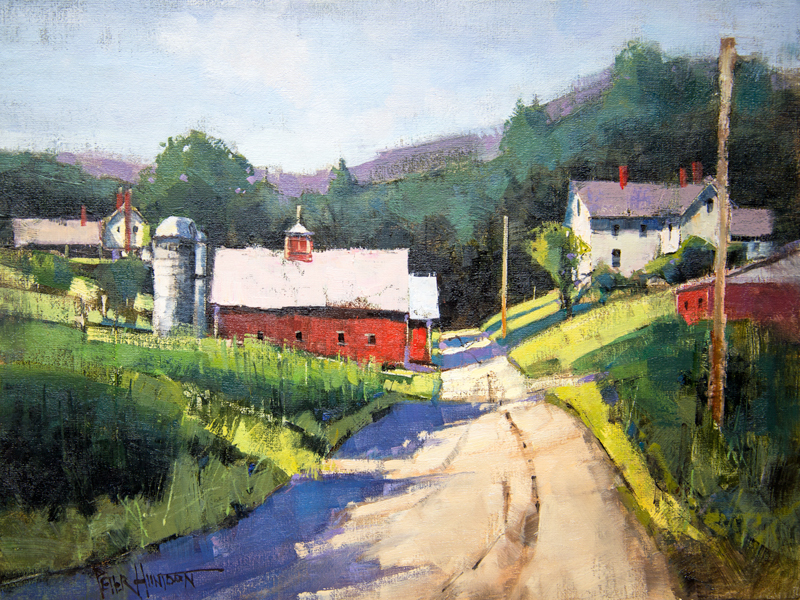 Love this painting, I am partial to country roads, barns and age. This would be a peaceful walk to restore your soul and clear your mind. Your work always touches my heart. Very nice. Feels like I’m walking down the road. Love this picture. We farmed for over 30 years. 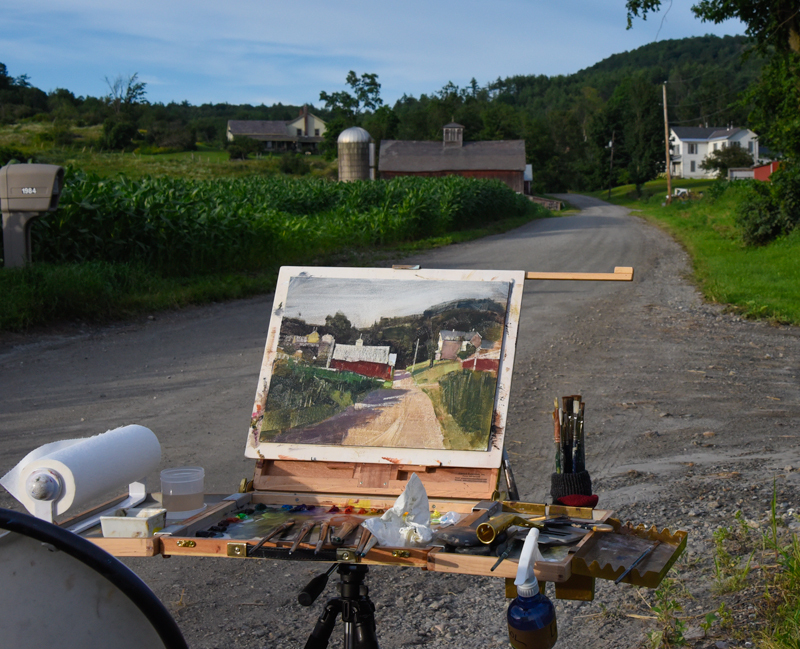 This painting captures the true meaning of the Vermont Farm. Love,love this painting. This was my dad’s original farm before moving to our other East Poultney farm/house. Thanks Marcia, I did not know that! road to between buildings of a farm ? Yep, I’ve seen quite a fee like this! This painting just “screams” Vermont! Love it. wow…that turned out nice….it makes me want to live near there…oh wait…I do! Congratulations on your show. You are always an inspiration! I didn’t know if you were aware or not, but the house on the left hand side of your painting, the one that sits on the rise, was, at one time, the local courthouse!! My grandmother often talked about it. She was the school teacher at the little school house just a tiny bit further up the road. I always enjoy your work. It’s so relaxing and calming to look at. I did not know that Kathy, thank you! I was raised here on the farm. It is a quiet road most of the time, great place to get lost in thoughts and just feel peace. Many memories of everything this painting has captured and then some. You did a wonderful job. I just love it. Peter you’ve done it again. It feels like I’m walking right down the road. You have captured the beauty and peaceful feeling of Vermont. This picture says “home” to me. Vermont perfection! 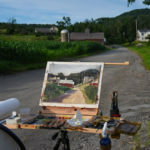 It occurs to me that farming and painting are very similar occupations. Whether it be seeds of corn or of artistic inspiration, both must first be sown. Then, with a generous measure of hard work, wisdom gained from prior experience, clear vision, the blessing of God, and a certain amount of sheer luck, comes the reward. This painting is truly beautiful. Now may the farmer’s corn will win its struggle over a wet and stormy summer to yield an equally rich harvest. Good points Brian as always. Thank you! Great painting. This happens to be the farm I grew up on for my first 10 years or so. I was back visiting this summer and bought my syrup just down the road at Greene’s. A whole lot of people grew up here or have roots here. Thanks Michael! Love this serene painting. Wish I were there. Thanks, Peter! draws me in ! very nice.